To create, produce, and buy successfully it is essential to have a vision of what customers will want in the future. The future is here. In this edition we cross-reference product categories, global shifts, and a slew of products shown at recent exhibitions to bring our readers must-have information. Review trendy colors and finishes, up and coming talent, inspiring events from Dutch Design Week, a then and now review of British textiles, colors and more. Where will they go next? 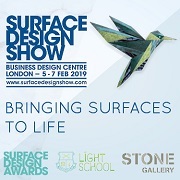 Also learn about the sustainable home of the future, innovations for tabletop, decorative accessories, and furnishings. Witness creative designs from Taiwan to major European fashion capitals. See how styles are moving right off the runway into the home. Get inspired with the November edition! We are looking for the most inspiring products to decorate our space at some upcoming design events! Gain exposure to the top international buyers, manufacturers, and design professionals! Send us photos of your products to opportunites@trendease.com and we will send you more details. 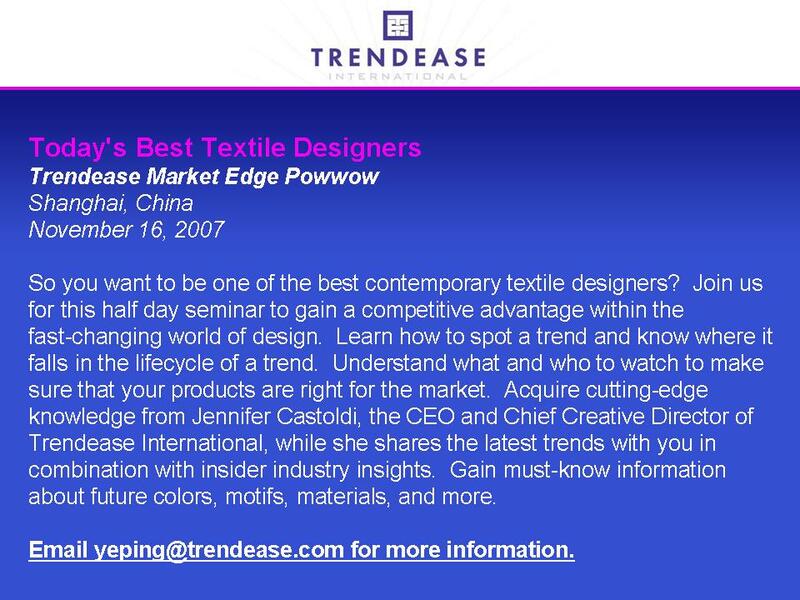 Also, any new Trendease subscribers or renewals between now and January 9, 2008 will receive the Heimtextil 2008/2009 trend book for free! - Nov. 16th: Today’s Best Textile Designers; Shanghai International Creative Industry Week, China. Valencia — Open-mindedness and thinking outside of the box are two things that bring innovation and success. May this issue and all issues to come inspire you in a myriad of ways! Remember the balance of the trendy merchandise mix? With that in mind, this issue will help you figure out where you should be looking. In this gallery experience a whole new type of inspiration and read up on Jennifer’s thoughts on this latest edition of Trendease. Worldwide — The world is passionate about this shade. In March, Trendease brought its readers an in-depth report on this color trend and some of the reasons behind it. The color is still going on strong and has spread into many more product categories, window displays, and fashion runways in Paris during the recent fashion week. This gallery of images brings readers up to speed with this color on the run. Multiple European Cities — After researching the meanings behind this color of the sun, it is understandable why it has moved its way to the catwalk and new collections of textiles, ceramics and decorative accessories. It catches our attention, it makes us feel warm and cheerful, it gives us hope, and it represents natural luxury. Let this gallery of the hottest products from recent trade shows bring a little sun in to your life. Eindhoven — For this year’s Dutch Design Week, students from Saint Lucas Design School - an intermediate vocational training college for communication, advertising and interior design - designed the window displays in the famous department store, de Bijenkorf, in Eindhoven. The displays demonstrated the theme and concept of ‘design works,’ to show how design and communication can mutually enhance one another. Eindhoven — Sound. Touch. Smell. Sight. TASTE. Eat Drink Design is a newly conceived restaurant-gallery hybrid where top designers and top chefs team up to serve up a feast for the eyes as well as the stomach. Experience all of the senses here within. Multiple Taiwanese Cities — Since the 1990s, Taiwan’s cultural identity has flourished. It is asserting its own approach to design that is reflected in its cosmopolitan outlook. Like Taiwan itself, the designs effortlessly meld a range of styles and ideas. A global approach to design is indicative of Taiwan’s rich cultural tapestry and its ability to set itself apart from mainland China. Pulsating and picturesque, this tiny island is a melting-pot of design. Multiple British Cities — Much of Britain’s textile production has moved to countries that allow for lower costs and therefore greater output and revenue. So, the question arises: what is left of the British textile industry and how are designers responding and adapting to their production needs? With such a long history in the sector, is it all just disappearing? What are designers doing to keep their textile tradition still alive? Multiple European Cities — One might assume that most carpets are simply decorative floor coverings with beautiful patterns and colors, but usually without great mystery or purpose behind them. Interesting and provoking themes are floored in this month’s gallery. See the latest styles, motifs, and colorways in this feature. 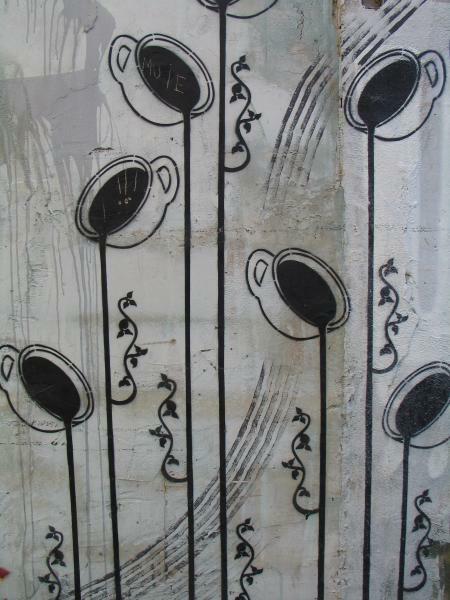 Eindhoven — Here, everything is possible where nature, culture, biology and design intertwine and become one - ecodesign. Ten designers in total were asked to integrate living nature into their work as an inspiration for sustainable, ecological and biotech design and as a translation of the most recent environmental theories into everyday objects and visions on nature and culture. Resulting from this philosophy, the designers created inspirational, ecological pieces that bring nature closer to our home. Multiple European Cities — The New Talents from across Europe have engaged in the same mission: to make table settings more enjoyable and interesting. As a result, they have surpassed themselves and their tabletops overflow with creativity, quite literally topping the table with new inspiration for pleasant meals and drinks. Eindhoven — With the Sustainable Habitat, buildings are created for the future and tend to the damage humans have caused to nature. Instead of being dependent, we will be efficient and sustainable, as our buildings will supply us with all the necessary resources that we need to survive. In this feature read about new strategies for a sustainable urban future and watch a video illustrating the innovation. Worldwide — Oceans around the world could have been the inspiration behind the products found within this week's gallery. This splash of color has been a global success before and now it looks as if it is back for another round. See a school of designs swimming upstream within this gallery and read up on design opportunities and more. Worldwide — The love of fresh or silk flowers and plant life in interiors has grown. And so has the multitude of options on where to put them! Trendease has scouted the globe to bring you this week’s gallery of stylish vessels suitable for their home or powerful enough to stand alone empty. Subscribers are welcome to plant themselves into this gallery of accordion shapes and wrapped effects, metallic and iridescent finishes, unique forms, and organic / naïve shapes and new innovations. 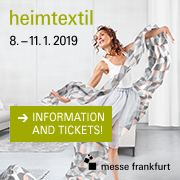 Worldwide — This week’s gallery encompasses one of the hottest contemporary international trends on the market for product categories from textiles, wall paper, upholstery, bedding, eco-luxe items to candles, vases, lighting, bathrooms, and beyond. The newsletter also includes factoids on retailing and a fresh packaging buzzword.